The WDW Railroad is next in our Attraction Guide! 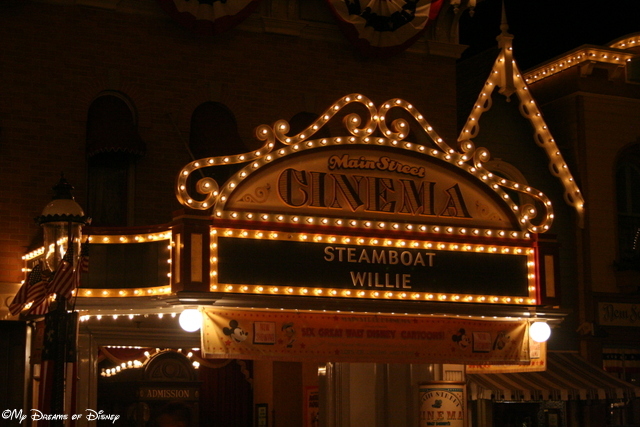 Location: Main Street, U.S.A., with stations at Frontierland and Fantasyland as well. Hours of Operation: Park opening until just prior to the Wishes Fireworks show. I don’t know about you, but it seems like the Walt Disney World Railroad is something that boys like more than girls. I don’t doubt that I’m wrong, and that I’m stereotyping here, but in my family, riding the Walt Disney World Railroad all the way around (and sometimes further) is something that I really like to do, while my girls would rather just ride it one stop and get off — although they do humor me. I don’t need to ride it every day we are at the Magic Kingdom, but it is definitely on my list for at least once per visit. The Walt Disney World Railroad has several steam locomotives; they include the Walter E. Disney, named after Walt himself, the Lilly Belle, named after his wife, Lillian, the Roy O. Disney, named after Walt’s brother, Roy, and the Roger E. Broggie (pictured below), named after one of the key Imagineers who helped with the Walt Disney World Railroad. 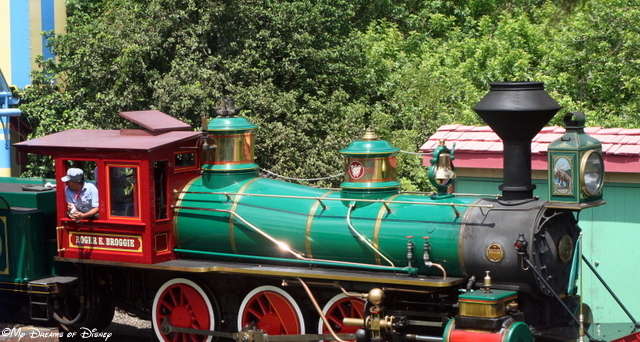 The Roger E. Broggie locomotive is named after the Imagineer that helped Walt with the railroad! Do you and your family take time to ride the Railroad, and if so, how far do you go? All the way around or just to a stop or two? Let me know in the comments, and thanks! 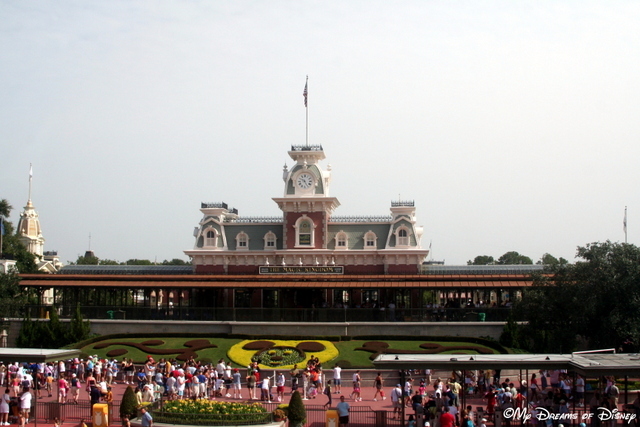 Welcome to the Magic Kingdom Attraction Guide! In this series, we are going to work through each of the six Lands that make up the Magic Kingdom, so starting us off, we’re going to look at the attractions of Main Street, U.S.A. Kicking us off is the Main Street Vehicles! Here is all of the relevant information that you need to determine if this Attraction is for you. Hours of Operation: Varies, but usually just a couple of hours early in the morning. 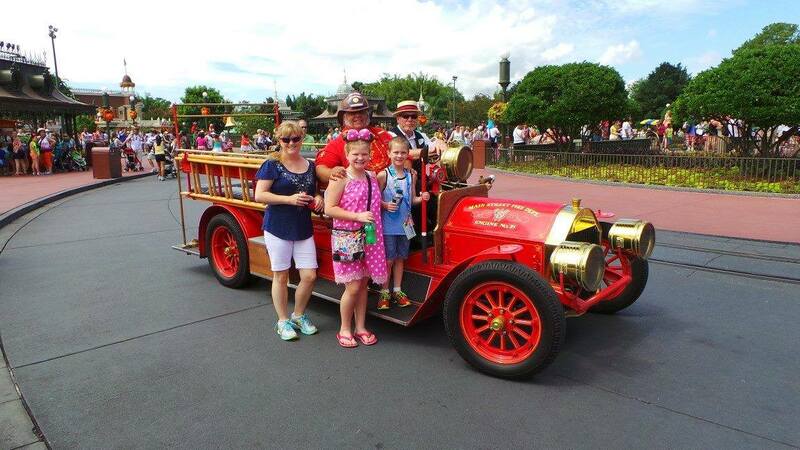 In addition to the early style Fire Truck that you see above, the mode of transportation can also be via a Horse-Drawn Street Car, a Jitney (this is an early automobile without a roof), or via Omnibus, which is an open air double decker bus. 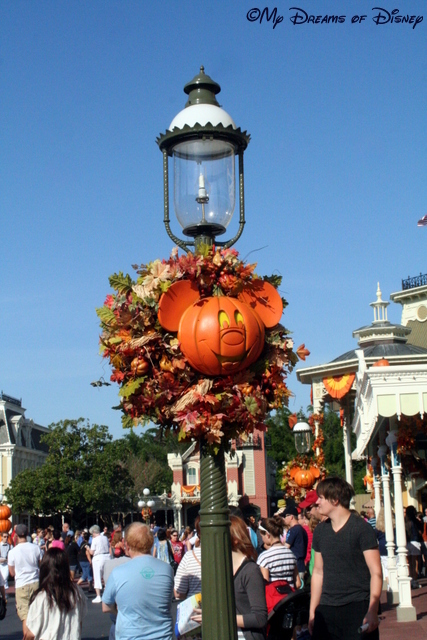 This attraction has limited hours because of the crowds that can clog traffic on Main Street as the park gets busier. This is a one-way means of transportation, starting at either Town Square or in front of Cinderella Castle, so you can get on at one of the stops but you are required to get off unless there is nobody waiting to get on. For my family, this isn’t something that we often see, but I can see us doing this one morning when we are visiting. I don’t see us needing to experience it more than once. What do you think? Let me know in the comments, and thanks! 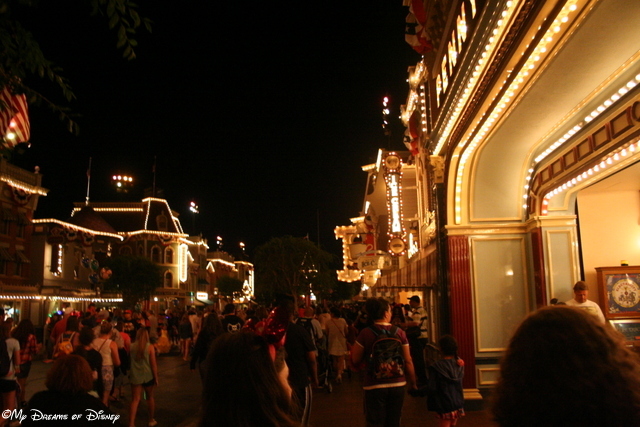 Some of the best experiences of Main Street, USA, are at night! A few weeks back, I wrote an introductory post called “Coming Soon: The Lands of Disneyland!” Well, after what seems like an eternity, here I am, finally writing about the first land you come to at Disneyland — Main Street, U.S.A.
Much like it’s counterpart at the Magic Kingdom in Walt Disney World, Main Street, U.S.A. takes all the best traits of a bygone era — when things were simpler, less complicated, and perhaps, more wholesome — and combines them in Main Street, U.S.A. This street could be found in Anytown, USA, but in truth, it draws it’s inspiration from the town of Marceline, Missouri, the town where Walt Disney spent some of his formative years growing up. Unlike the Magic Kingdom Main Street, U.S.A., the Disneyland version has quite a bit going on, including some things that you don’t find anymore at Walt Disney World — in fact, things that I wish still existed. Let’s take a look at some of those in more detail. Great Moments with Mr. Lincoln is located in the section of Main Street known as Town Square — that part of the street that you see right after you enter the park. Officially known as The Disneyland Story Presenting Great Moments with Mr. Lincoln, this isn’t just a museum/show about President Lincoln. Located within this building are some incredible artifacts that you will want to take a look at and examine in more detail when you are there next. 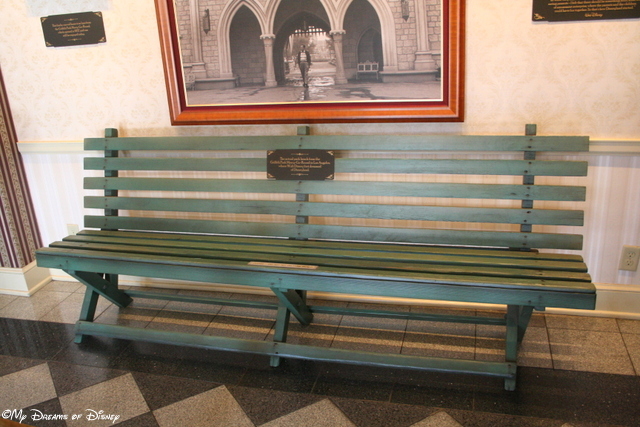 This bench was located in Griffith Park, and was the very park bench where Walt Disney would rest — and dream up Disneyland! I love models, and trains, so what better to look at than a model of Disneyland with the Railroad on it! 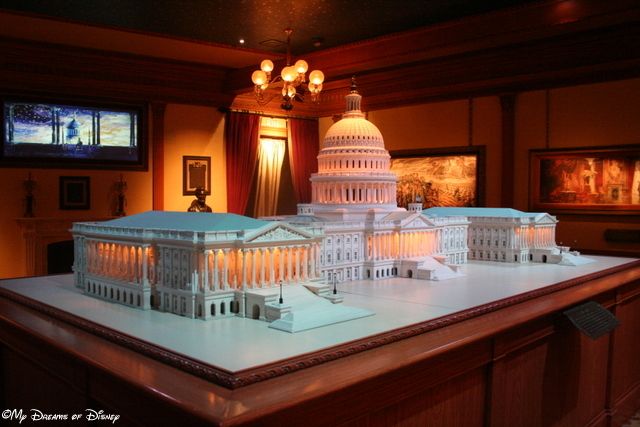 This model of the Capitol in Washington, DC, is made of the same stone as the original! 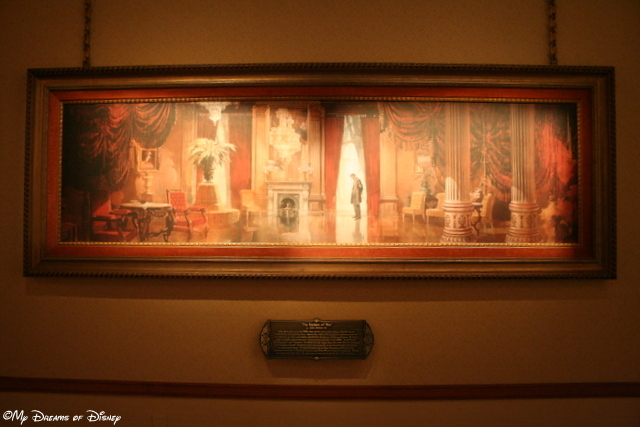 This painting of President Lincoln illustrates the decisions that a President must make alone at times. The Main Street Cinema still shows original cartoons of Mickey Mouse and his friends, including Steamboat Willie! Further down Main Street is the Main Street Cinema, a small theater where you can go and watch some of the great Mickey Mouse short cartoons, including the original, Steamboat Willie! I remember when you used to be able to go into the Main Street Cinema at the Magic Kingdom in Walt Disney World and see the cartoons, but that is no longer the case, sadly. Now, the Main Street Cinema in the Magic Kingdom sells art. The Light on in the 2nd Floor is the apartment that Walt Disney would stay at. 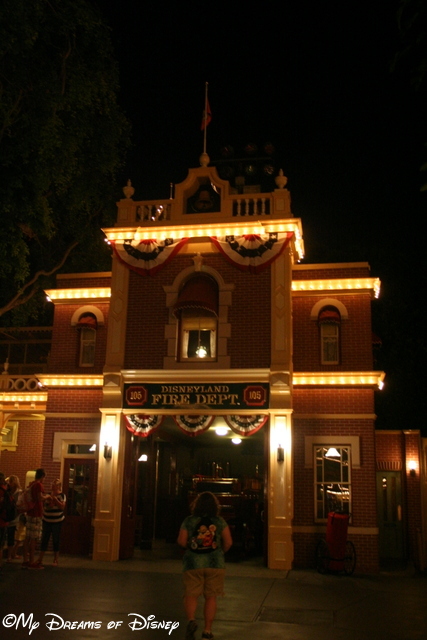 The Disneyland Fire Station is also located in the Town Square section of Main Street. As you can see, there is a light on in a window on the 2nd floor of the building. Did you know that this was an apartment that Walt Disney would sleep in sometimes during the construction phase of Disneyland? When he passed away in 1966, I believe that is when they started turning the light on in the apartment, as if waiting for him to arrive home. Unfortunately, the Fire Station exists at the Magic Kingdom in Walt Disney World, but what began as a duplicate of the Disneyland station gradually was turned into a gift shop, and now it is one of the starting points for the new Magic Kingdom game you can participate in known as Sorcerers of the Magic Kingdom. The Disneyland Railroad stands tall at the entrance to Main Street, U.S.A.
As I mentioned, I love trains, and the Disneyland Railroad is no exception! We rode the train once or twice, and enjoyed every minute of it! In case you don’t know, the Disneyland Railroad has stops at Main Street, U.S.A., New Orleans Square, Tomorrowland, and Mickey’s Toontown, so there are plenty of ways to get around that don’t include just walking everywhere! In addition to the attractions I listed above, we also have the standard gift shops that grace Main Street the world over, and some good dining locations for snacks or even meals. Most of them are similar to what you can find at the Magic Kingdom, but one, the Jolly Holiday Bakery Cafe, is not found at Walt Disney World, and is a fun little place to go in and get a pastry from! 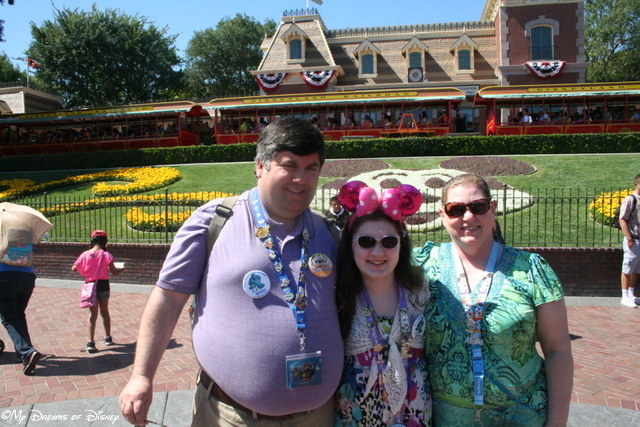 I hope you have enjoyed this look at Main Street, U.S.A. at Disneyland Park! When you and your family come visit Disneyland, how much time do you spend in Main Street? Is it your stepping stone, your path, if you will, to bigger and better things, or do you savor what you can find here and enjoy every moment you spend here? Let me know in the comments, and thanks! In addition to the fall decorations, everything just seems more crisp, more clean, perhaps; almost like, with the humidity receding into the recent past, it has taken with it anything that may have made your visit less magical. When we visited for the 40th Anniversary of Walt Disney World, the thing I was struck by was how it felt like Disney really did have a dome over the sky to prevent any bad weather. I don’t think I remember a better time to visit than that weekend in 2011, as these photos show. Just look at how perfect the sky looks that day! Over at Epcot the Epcot International Food & Wine Festival is going on during the fall. Since we were visiting, it wouldn’t be right to not stand in a kiosk line and try some of the great snacks from around the world! 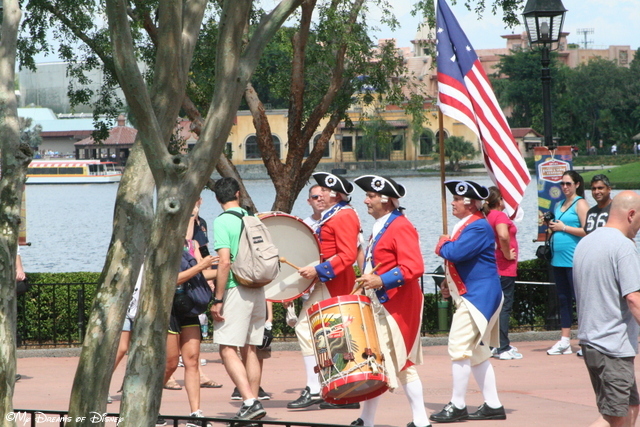 Also, you never know when you are going to see some of the great sites around the World Showcase, such as the appearance by the Spirit of America Fife & Drum Corps! The Spirit of America Fife & Drum Corps marches into position to play for us! 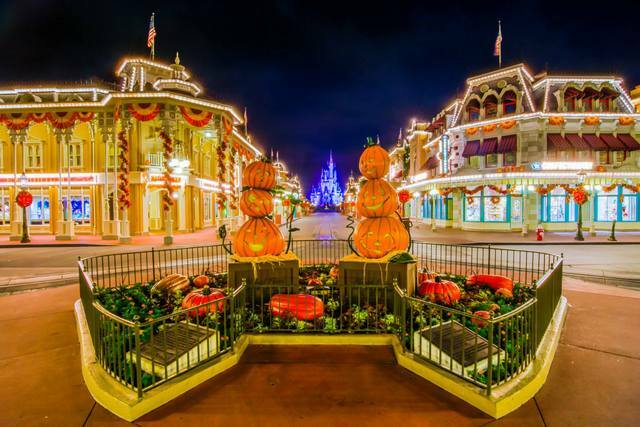 Of course, a lot of people come to Walt Disney World during this time to see Mickey’s Not-So-Scary Halloween Party over at the Magic Kingdom. I haven’t seen that yet, but with the help of a friend of mine, Andre from WDW Shutterbug, I am able to share with you a picture that gives you an idea of what it will feel like if you were to attend during this time. What I find amazing is how incredibly peaceful it is at the Magic Kingdom late night, with all of Main Street, U.S.A. lit up, and Cinderella Castle beaming at you at the end of the street. It’s an amazing time, and I’m certain you will agree with me that Andre’s shot truly captures the majestic beauty of the Magic Kingdom during this time of the year. Special thanks to Andre from WDW Shutterbug for sharing his art with us! Until next time, my friends, remember to make it a Disney Day! 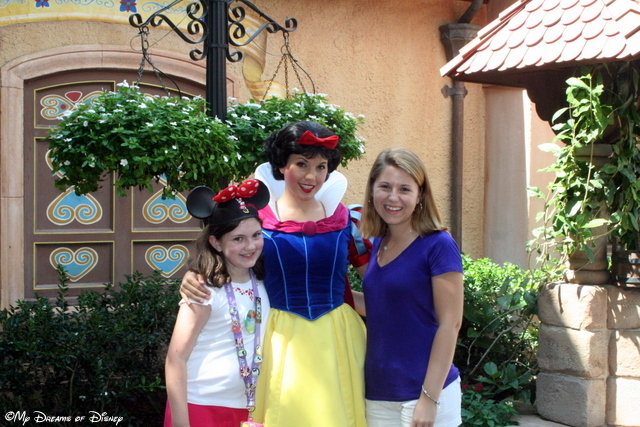 Today I thought I would share my “must dos” from Disney’s Magic Kingdom. I must say that while I love all four Disney World parks, the Magic Kingdom will always have a special place in my heart. That’s probably because it was the first Disney park I visited but also because it’s based on Disneyland which had Walt’s touches everywhere. The magic starts before you even step through the turnstiles. If you don’t stay in a Disney hotel, parking for the Magic Kingdom is across the Seven Seas Lagoon over at the Ticket and Transportation Center. You can travel over to the park via the monorail or the ferry. 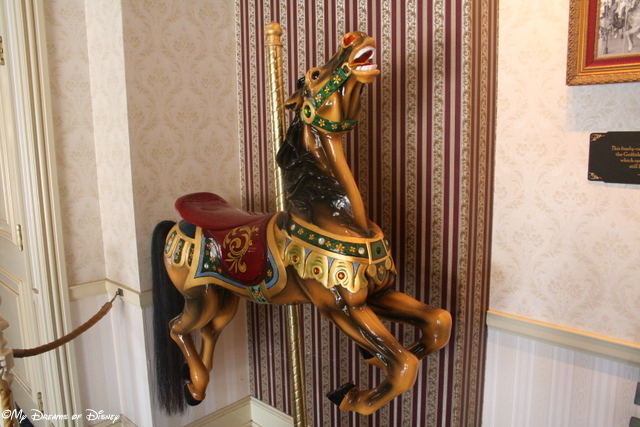 I usually try to ride one on the way to the Magic Kingdom and the other on the return trip. Of course, some people have a preferred method of travel, but I suggest you try each at least once (unless you get seasick, then I would stick to the monorail). If you are staying on property, the Disney buses take you right to the Magic Kingdom (the exception being the “Magic Kingdom hotels”. There are still buses that go from the hotels but there are additional options here. Guests at the Contemporary and the Grand Floridian have the monorail and the ferry available to them or you can walk from your hotel to the park. Polynesian guests have the monorail and the ferry as additional options. Guests of Wilderness Lodge and Fort Wilderness also have a launch available to the Magic Kingdom). 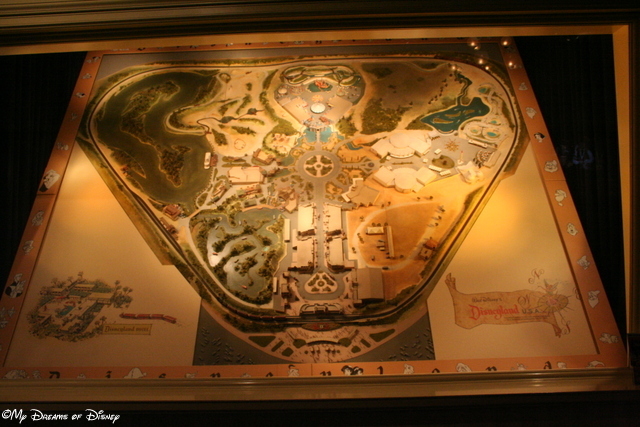 I think the easiest way to describe my favorites is by “land” and each land by order of how I travel the park (meaning I will start on Main St. USA and then head left to Adventureland moving clockwise around the park). Starting on Main Street, I always ride the Railroad. I hit the Chapeau (THE place in the Magic Kingdom to get monogrammed mouse ears) to check out the newest ears. Main Street is my favorite place to watch parades as well as the Wishes! fireworks show. Finally, I always eat at the Crystal Palace. While it may seem pricey, I stay on property and get the dining plan (this restaurant is included on all the Disney dining plans except the “quick service dining plan”) and I can’t resist a good buffet with Winnie the Pooh. Next up is Adventureland. I love the Jungle Cruise. Between the interesting animals and the silliness and puns of the boat captains, it’s lots of fun that I never miss. If you read my posts, you won’t be surprised that my next must do is Pirates of the Caribbean. If I could only ride one ride at Disney over and over again, it would have to be Pirates. If I could, I would move into this ride (you think I joke but I am enthralled with this ride). I also always visit the Enchanted Tiki Room. Coming next is Frontierland, home of two of the three Magic Kingdom mountains and my Frontierland must dos. 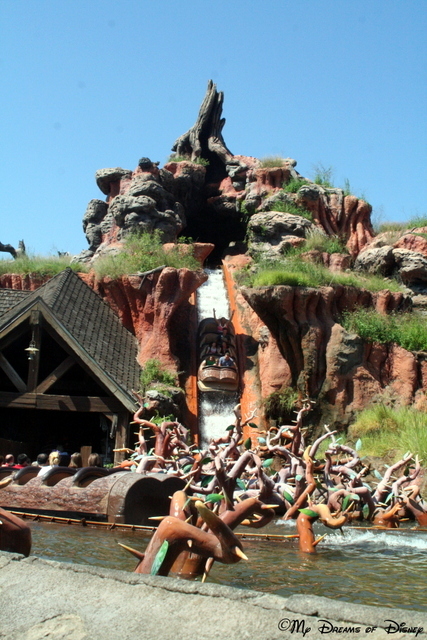 Splash Mountain is a fun ride through Disney’s “Song of the South”. Briar Rabbit is a fun character that we join for adventure. Big Thunder Mountain is a runaway main railroad ride through the Old West. Continuing on, we come to Liberty Square. The Hall of Presidents may not interest everyone but I am a huge fan of American history so I love this one (plus it’s cool, dark and you sit for the whole show, a welcome break at Disney). If I could live in Pirates of the Caribbean, I would work at the Haunted Mansion. 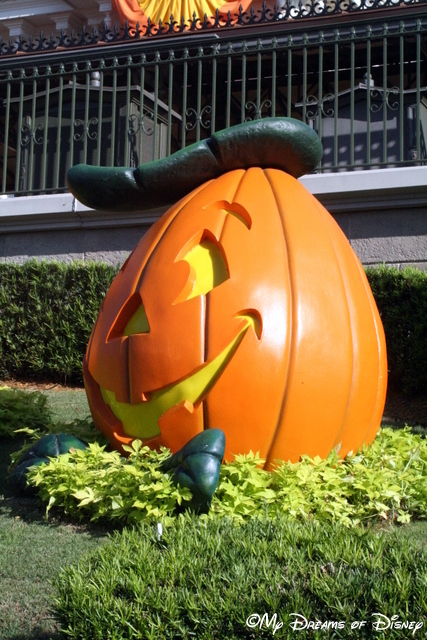 More fun than scary, the Haunted Mansion is lots of fun. Oh, I also always hit the fruit stand by the Hall Of Presidents for a yummy pickle and a water. Its a welcome break during the day. Next on our tour is Fantasyland. I never miss Mickey’s Philharmagic; a fun, multi-sensory trip through Disney movie music. I always hit the Many Adventures of Winnie the Pooh which is a whimsical ride through the Pooh movies. I hit Mrs. Pott’s Cupboard for a strawberry shortcake sundae (a yummy mix of a strawberry shortcake and a strawberry sundae) and while I haven’t been there yet, I am looking forward to seeing Beast’s Castle. Last but not least is Tomorrowland. I hit Space Mountain, a fun roller coaster ride in the dark (if your kids are afraid of the dark, you may want to skip it). I love Monster’s Inc. Laugh Floor (again, not a surprise if you have read my other posts). I visit Experiment 626, also known as Stitch! The Escape (this show has moments of complete darkness with audience members held in place by shoulder harnesses, things to keep in mind if you are traveling with little ones). Two of my favorite must dos are often overlooked but provide chances to sit and rest your sore, tired feet. There is the Tomorrowland Transit Authority which is a ride above Tomorrowland on a track powered by magnets (really cool). Finally, there is Carousel of Progress. This is an entertaining show that follows an American family through many of the best technological advances of the past 100 or so years. 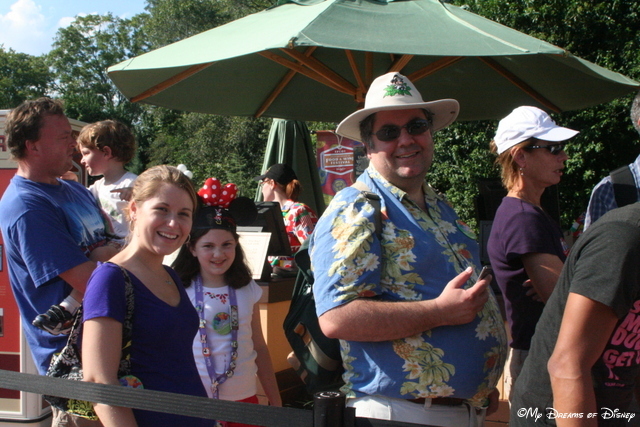 Do you have other Magic Kingdom must dos? I’d love to hear from you. Up next, my Epcot Must dos coming soon.